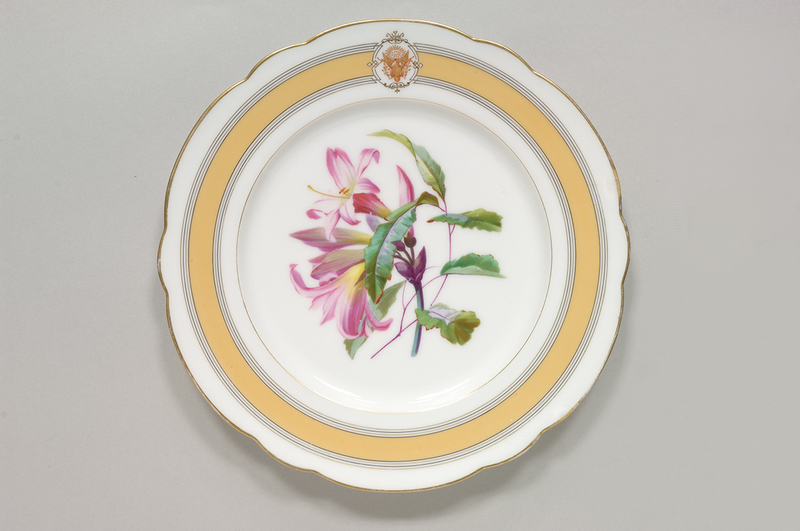 Of the three Limoges manufacturers represented in these antique floral pieces—Charles Field Haviland, Martial Redon, and Haviland— only Haviland is still in operation today. 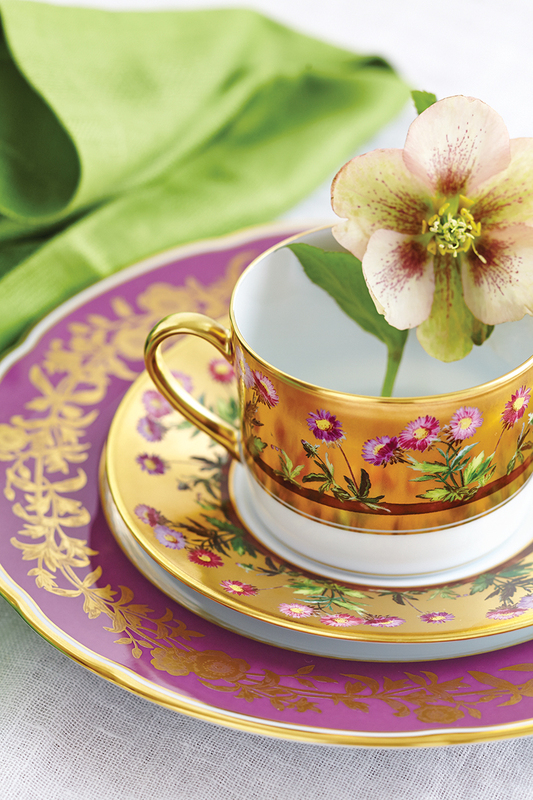 Luminous limoges porcelains have created an aura of hauteur on best-dressed tables for hundreds of years. In the 1860s, glamorous Empress Eugénie rekindled Marie-Antoinette’s famous obsession with flowers when she commissioned an elaborate table service strewn with pink cabbage roses. After the demise of France’s Second Empire and the Bonapartes’ exile, the last empress found solace in a subsequent set festooned with gentle Parma violets. Today, the porcelains erroneously dubbed “Limoges china” are still a favorite choice of brides and trendsetting hostesses, inseparably entwined with the best of times. 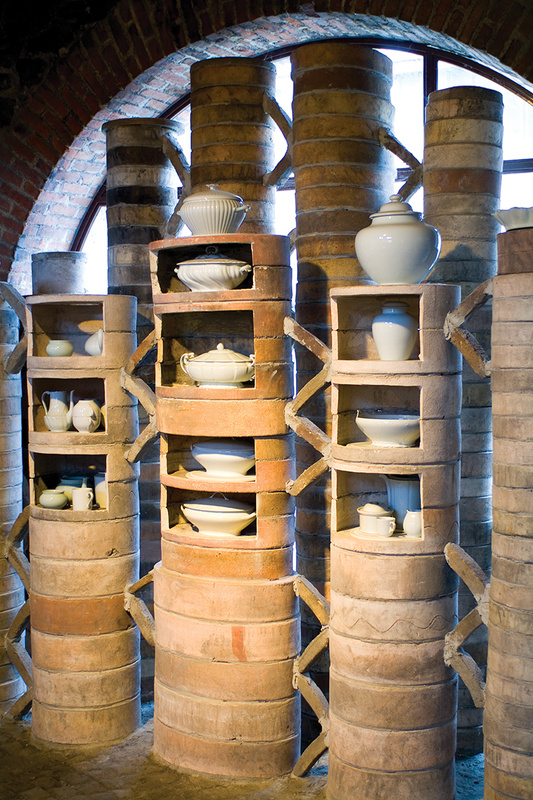 Until the 1700s, the porcelains imported by the Western world came from China. In 1765 the discovery of rich deposits of a white clay called kaolin, near the hilltop town of Saint- Yrieix-la-Perche, France, created a thriving, new hard-paste industry in the Limousin region 250 miles southwest of Paris. 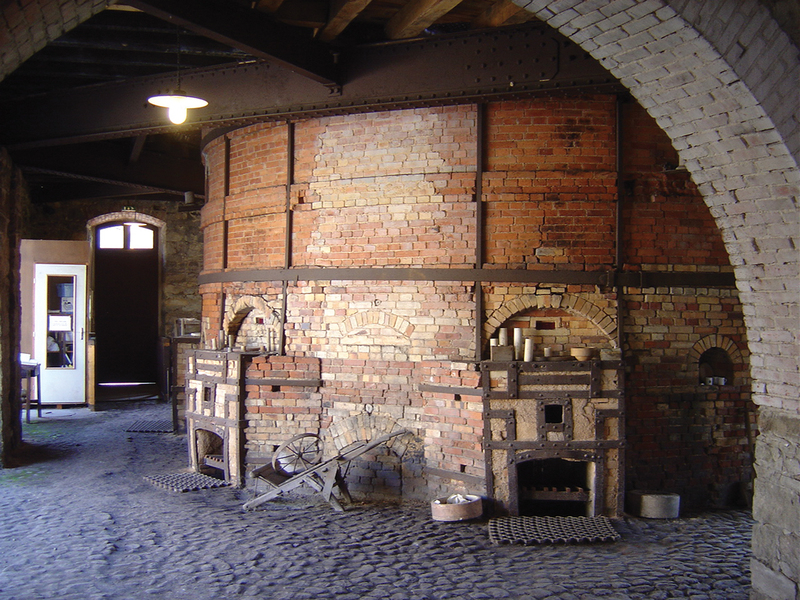 Wood for the kilns came from nearby forests, and water from the sparkling Vienne River. By the mid-19th century, Limoges not only dominated French tableware production, but also was exporting 80 percent of its goods to the United States. 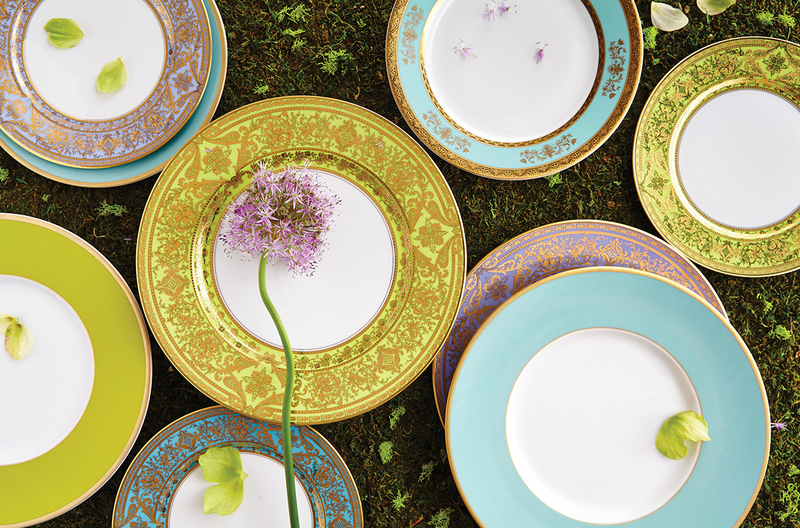 Now, most Limoges products are available worldwide. But whether your own cupboard brims or begs for more, a trip to Limoges offers a tantalizing opportunity to shop at the source. 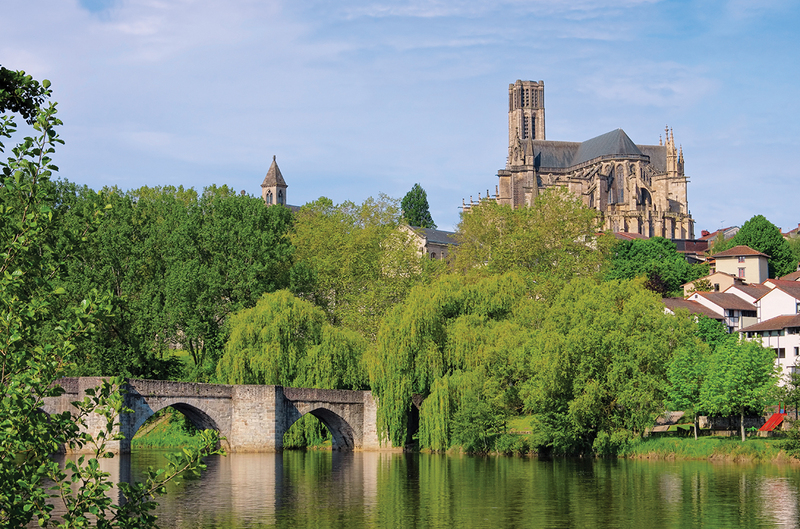 About four hours by train from Paris, the medieval town of timbered buildings and arched, 13th-century pedestrian bridges rises out of a pastoral landscape of dun-colored fields and swaths of nodding sunfowers. Museums and factories decorated with enameled tiles speak of the porcelain that gave Limoges its identity, and myriad shops offer an array of the wares that have made the area famous. Delicate floral garlands and shimmering gilt accents distinguish this exceptional, 143-piece, circa 1920 Limoges porcelain dinner service. Crafted by Gerard, Dufraisseix & Abbot, one of the most respected makers of Limoges porcelain, this beautiful service exhibits the high caliber of artistry achieved by this world-renowned company. 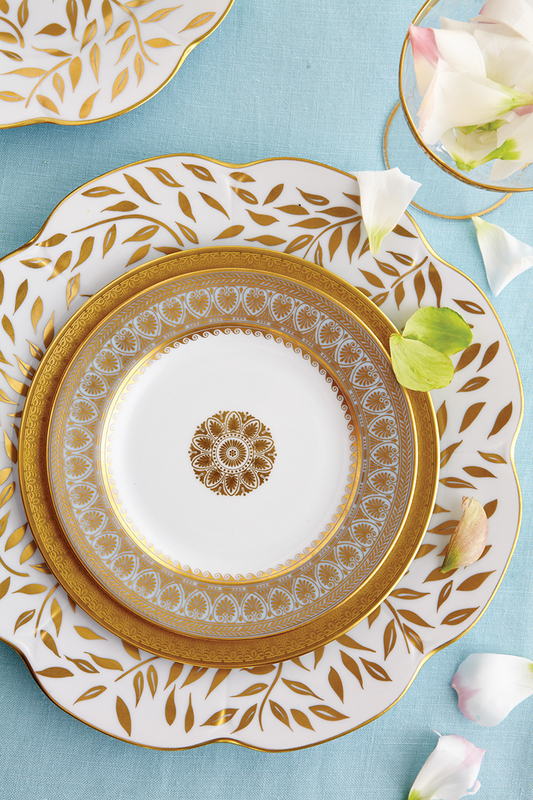 From the intricate hand-painted motif to the elegant scalloped edges, these pieces are truly stunning. Learn more about this Limoges dinner service available at M.S. Rau Antiques, New Orleans. 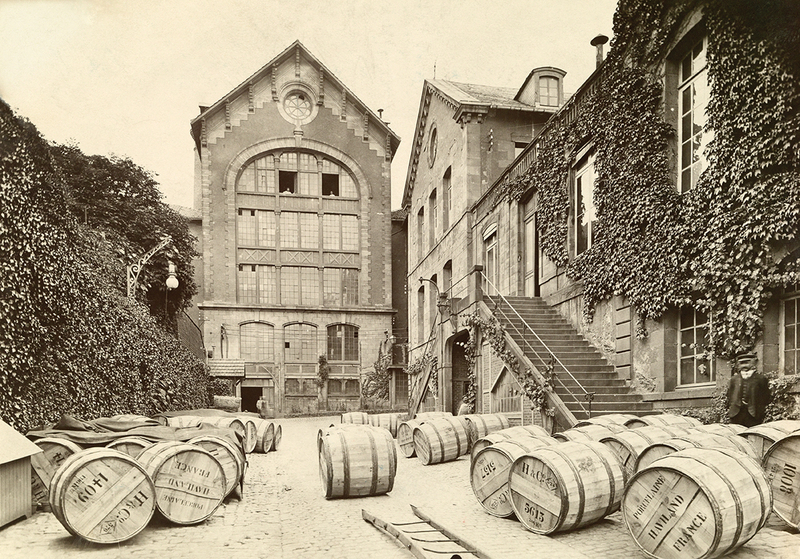 Among the 25 factories still in operation in the Limoges area, Royal Limoges, Bernardaud, Haviland, and Deshoulières have particularly distinguished histories. 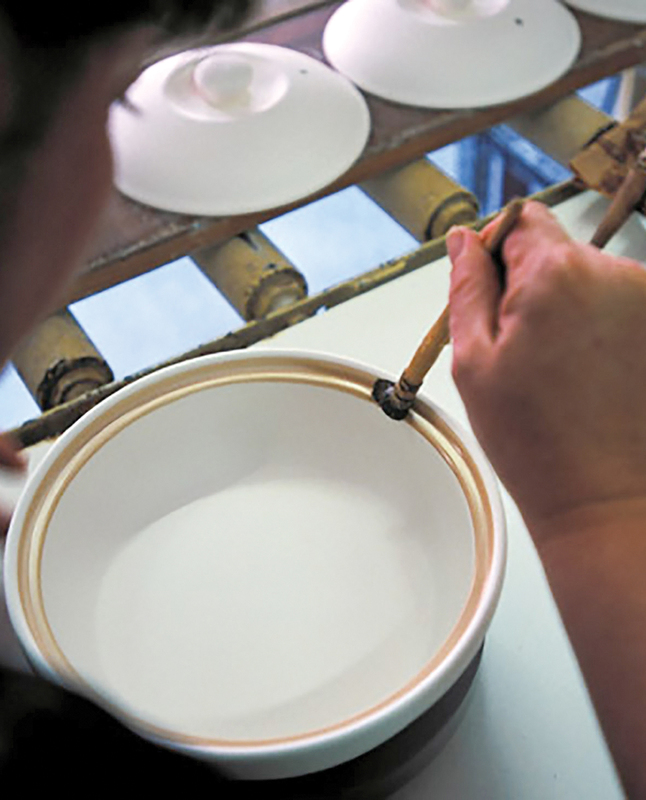 Royal Limoges, founded in 1797, is the oldest Limoges factory still in existence. Michel Bernardaud, a fifth-generation descendant, now oversees Bernardaud, Limoges’ largest manufacturer. Here the dramatic display of Empress Eugénie’s rose-covered service conjures images of lavish dinners and balls in the imperial Tuileries Palace. 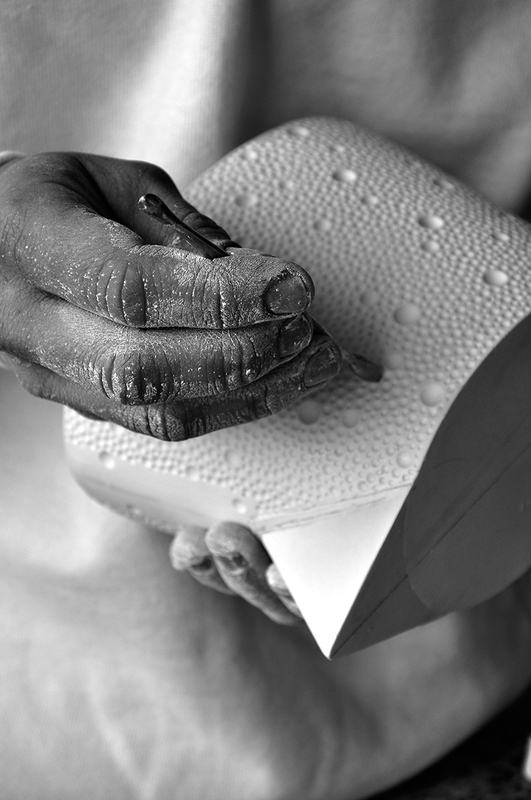 Today both Haviland and Bernardaud’s factories offer visitors a peek into the production process that begins with a water-based paste of kaolin, feldspar, and quartz pressed into molds. After initial firing and enamel glazing, an intense firing (at 1,450 degrees) called the “Grand Feu” bestows the porcelain’s distinctive whiteness and unparalleled durability as well as resistance to scratching and dishwasher damage. Initially, Limoges whiteware flaunted its undecorated translucency; then early decoration favored polychrome flowers and gold filaments. Floral patterns inspired by everything from botanical manuals and Japanese flower paintings to travel books and gardens decorate these pieces. Sometimes even real flowers were dipped in slip, fired in the kiln, and then applied to serving pieces or fashioned into centerpieces. Later, highly skilled craftsmen collaborated with famous artists such as Pierre-Auguste Renoir, who was briefly a plate painter. Currently, decoration is done by chromolithography, or decals, which are pressed onto each piece, then fired. Pieces with 24-karat-gold accents are still painted; spouts and handles are attached and decorated by hand. Although Limoges manufacturers have boasted famous patrons from every royal household and government, today they are just as likely to court partnerships with celebrity chefs and luxury hotels. And while many historical patterns remain as popular as they were in their time, using floral with graphic patterns, and mingling contrasting but compatible colors on the table is clearly the prevailing trend. “In the past, mothers and grandmothers helped a bride choose traditional, matched settings,” says Philippe Deshoulières, sixth-generation member of the Deshoulières Group. “Today’s sophisticated hostesses own several different patterns and love mixing them creatively.” This is good news for flower devotees, who no longer have to choose between peonies and tulips, or lilacs and dogwoods. A stylish tabletop might feature Deshoulières’ banded presentation plates beneath refined floral dinner plates from Bernardaud, and Raynaud salad plates rimmed in delicate leaves. Dessert? Great-grandmother’s gold-incrusted antique plates with individual flowers. A Bernardaud Eden Turquoise teacup and saucer sits atop a Haviland Ritz Imperial White salad plate and Bernardaud Elysee dinner plate. 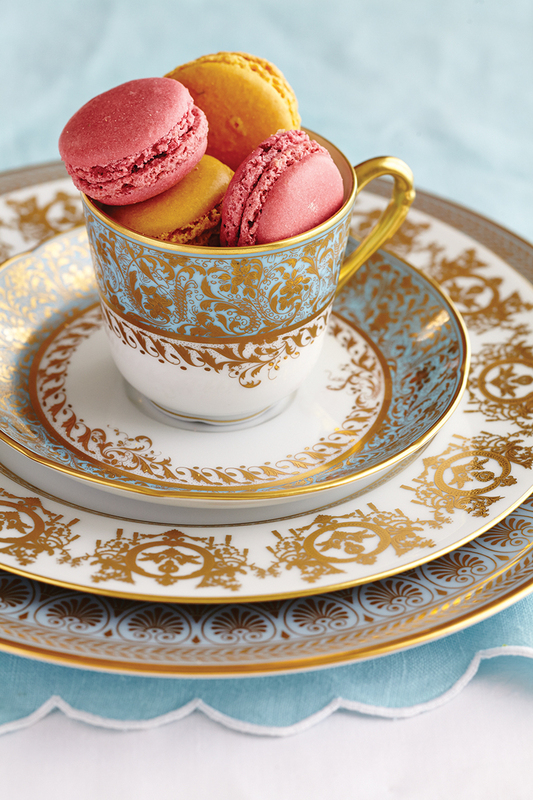 Gold incrustation plates from Philippe Deshoulières and Haviland would make an alfresco luncheon fit for a queen. Art imitates life in Bernardaud’s Parma bread and butter plate and Heloise teacup and saucer.